You are being watched. Your privacy is being invaded. Your stage is lit, exhibitionist. We now live in a world where every aspect of our lives is being monitored. The ever watchful eye of surveillance cameras have become one with the urban landscape. Big brother IS our good cities' ever-expanding totalitarian limelight. Do you perform? Or turn and cover your face? Welcome. 24-hour surveillance [Finally, I'm being noticed] was installed in April of 2004 in the front window display of the long closed Clara's Fashion store. Whenever a passerby approaches the display they, merely by their act of approach, manipulate what they are observing. Voyeurism is turned outward. The observer is inserted into the video feeds and he/she begins to be recorded. The image of the new audience overshadows the other surveillance feeds in direct proportion to how much they try to get the camera's eye. If they stand still their image begins to fade away, disappearing them once again from the monitor feeds. Their presence ceases to be recorded by the piece. They then blissfully return to their life of over documented anonymity. As part of the San Jose Downtown Storefront Project this interactive artwork investigates the overall themes of interaction between the street, space, and audience. Although these themes are exemplified my all facets of the project as a whole, this piece is primarily designed to bring the audiences attention to: (1) The fact that they (the everyday people passing by) ARE being watched whether they like it or not and on a much larger scale than they are aware of. (2) By acknowledging and interacting with the citys cameras they change the results of the footage being taken of them. It becomes a product of their own design, something other than it was intended by the all knowing overseers. (3) The other installed art pieces showing downtown that make up this overall project. Those interacting with this piece can see the locations where the other surveillance feeds are coming from. By investigating the other sources they will discover the other works. This video is a literal run-through of the San Jose Downtown Storefront Project, installed along 1st street in 2004. It highlights some of the various interactive artwork installations that made up the show. Curated by James Morgan, Matt Haberman, and Michael Brown in conjunction with Phantom Galleries. Published in Switch. Filmed and edited by John Bruneau. Four network video streams are pulled from cameras strategically placed downtown. These cameras survaile the interaction between passersby and the other installations that make up the project. 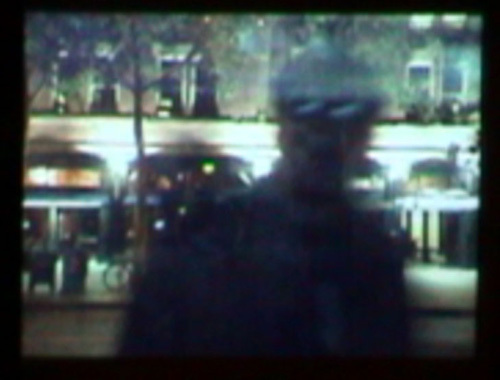 A fifth video stream is pulled directly from a camera located in plain view directly below the monitor. The initial 4 network streams are blended based on motion. The more action taking place in the fed the more prominent it becomes, washing out the other feeds. The resulting stream is then compared to the imitate camera stream. When one approaches the monitor the movement of their action causes their image to be the most dominant and the other feeds are washed out. If the motion from the immediate camera maintains a certain threshold the resulting video is captured as a series of still images at about 1.5 frames per second. The piece was designed in Max/MSP with Jitter. The motion is detected by comparing frames in the video stream with previous frames using the Tap Tools library extension. The video streams are handled by the QuickTime streaming server. Below is the Max/MSP design layout for the project.